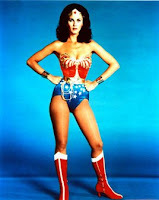 Off Wellman Way: Why Is Wonder Woman On My Mind? Notice I didn't Photoshop Wonder Woman. But the lady (man?) on the right, has really hairy legs and arms. I just wondered...Now, you are wondering why is this blogger, Susan Wellman Lazenby... is thinking about Linda Carter. Well, I saw her at the mall and she looks exactly the same. Wow! I couldn't believe it...she was in Santa Barbara and she was telling me all her secrets of her healthy lifestyle and how she runs 6 miles a day and I'm telling you a big, fat, lie! I don't know where she is, but I know she looks good, still. The stuff I think about in the middle of the night; and I don't know if it's related to a dream or what. Do you believe stuff gets exaggerated at night? It was a pain, lots of pain telling my husband what I did. I so felt like Lucille Ball when she bought the furniture when her husband, Ricky Ricardo told her "No." That episode was on yesterday, why oh why, didn't I think of it--what happens? The consequences? I just saw it! And I did exactly the same thing. But, no one will share it. Furniture you can share. I bought two pickin' bathing suits, with cover-ups! 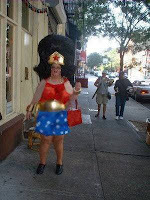 I couldn't sleep, I can really hear the wind and I have visions of me in a Wonder Woman outfit. The lady in the right looks kinda' like me, except, you know it's a man, and my hair is short, and my glasses are pretty. Actually, my chest isn't all that big either. Okay, now where do I swim?